The Harry Potter cast aren’t resting on their laurels. Variety reports that Daniel Radcliffe has signed on to star in indie comedy The Amateur Photographer. The film will be written and directed by Christopher Monger (Temple Grandin), who also wrote the novel it’s based on. The film, set in the 1970s, follows a young man who is asked by the residents of a small New England town to photograph them in “their most intimate moments.” He naturally clashes with local authorities and the town is irrevocably changed. 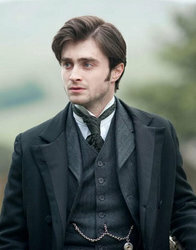 Radcliffe recently wrapped on The Woman in Black, a ghost story from the reincarnated Hammer Films. That film is expected to be released October 28, 2011 in the UK but has no US date yet.